When I was growing up in suburban Detroit, I spent countless weekends deposited with my father’s parents, Tom and Gerry. My grandparents lived at 13813 Vassar Drive, in Detroit. The house in the middle, built in 1941, when my father was seven. The birch tree in front of the house was there when I last saw the house in…gasp…1969, when I was twelve. My grandfather was quite the character. He was not a good husband. He was not a good father to his one child, my dad. He was not a good employee or businessman. He was however a really fabulous grandfather. Indeed, he was the perfect grandfather. He delighted in his four grandchildren, and to him we could do no wrong. We were perfect. Well, what more can one ask of a grandfather? My grandmother however was quite the opposite. She was forever focused on our many sins. I recall countless nights when we were all sent to bed for some misdeed. However, once in bed we but only had to count count the minutes…five minutes, ten minutes, perhaps fifteen minutes…before grandfather would quietly open the door, slide his smiling face into the sliver of light from the hall, then slowly bring his arm into the light, and wag one finger in the universal Follow Me signal. We would all beam with delight. This nocturnal ritual was both well-established and beloved. You see, Gerry would retire to bed right after putting her wicked grandchildren to bed. Then Tom would carefully wait until her bedroom light went off. He waited a bit more, then QUIETLY opened our door. With the wave of his finger, we quietly crept out of bed, followed Tom down the dark stairs, through the dark living room, and into the dark kitchen. “Shhhhhhh!” he would intone, but none too severely. He then flicked on the dim bulb lighting up the stove top, and we would carefully, quietly, pull out the chairs around the dinette set, and sit. Then came the moment. THE moment. Tom would open the Kelvinator…. 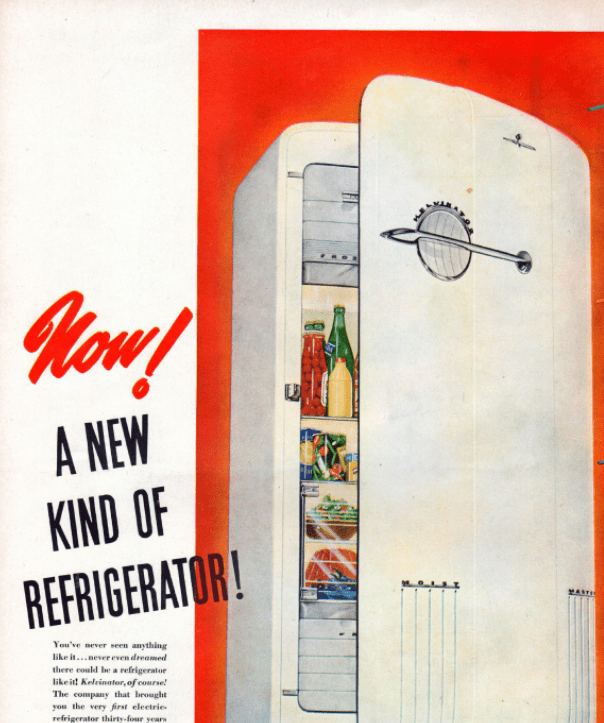 The Kelvinator was the refrigerator but Tom and Gerry ALWAYS referred to it as the Kelvinator. 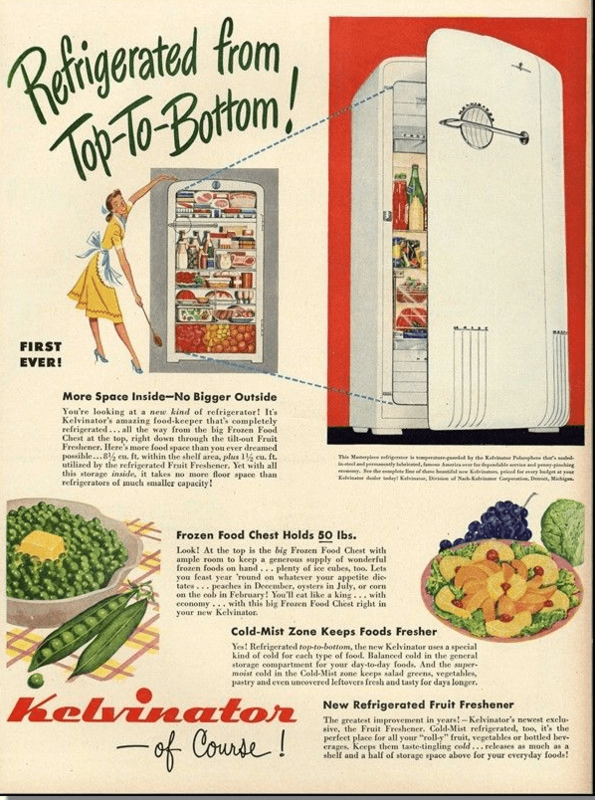 “Could you please put the salad in the Kelvinator?” “Can you please get some ice from the Kelvinator?” The model they had, I learned tonight while creating this post, was introduced in 1947. It was WAY more fabulous then the very dull 1960s refrigerator my parent’s had, and there was no question in my young mind that Flash Gordon had the same refrigerator Tom and Gerry had. To me, the mere act of opening the Kelvinator was a special opportunity. For, look at that long horizontal handle. The whole pulled forward to open the heavy door. It was a thrill. And it snapped shut with a loud and very reassuring CLICK. Yep, there was no question: the Kelvinator door was CLOSED. As we all sat quiet as mice around the dinette set, Tom would open the Kelvinator, and a shaft of light would spill out upon the table. He would then pull a carton of ice-cream from the freezer, and give each of us a scoop or two in bowls. We THRILLED in Tom’s obvious flouting of rules and loved him for it. As we savored our treat, Tom would regale us with stories. I do not recall ever hearing one twice. Did Tom and Gerry have the matching range?????? Of this, I have no memory. Looking back, I now assume that Gerry was well aware of this ritual. Right? Did Gerry and Tom conspire to create this Good Cop/Bad Cop routine? My grandparent’s sold their house on Vassar Drive in 1969, and I never saw it, or the Kelvinator, again. When I was eighteen my grandfather died. I never told him how much I adored him. One Response to The Power of Memories. 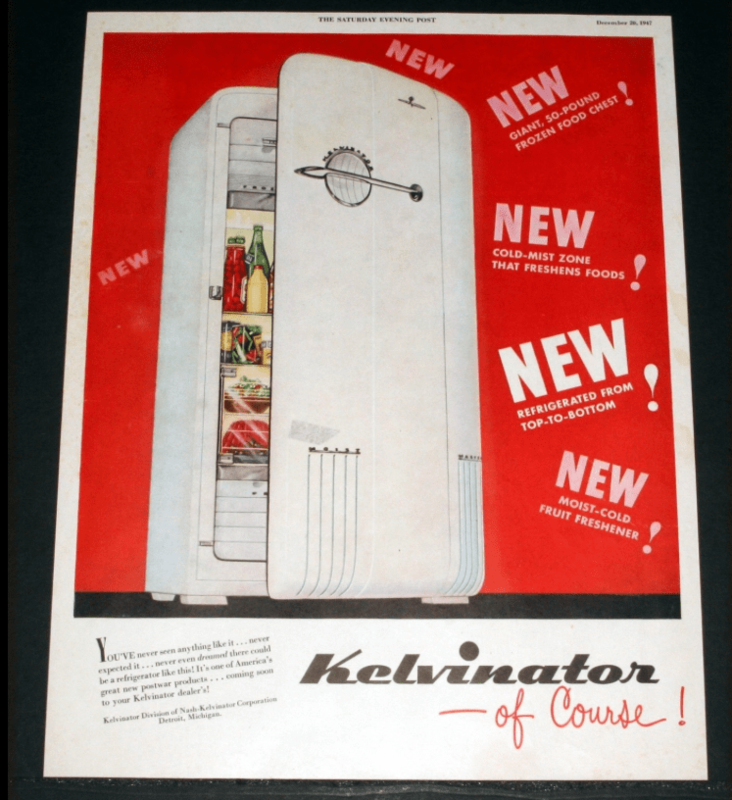 The Kelvinator! Oh my gosh. I LOVE that vintage advertising. Though I’m glad I don’t feel the need to dress in heels to do housework. One odd thing: The food color looks unappetizing to me in the ads from this era. 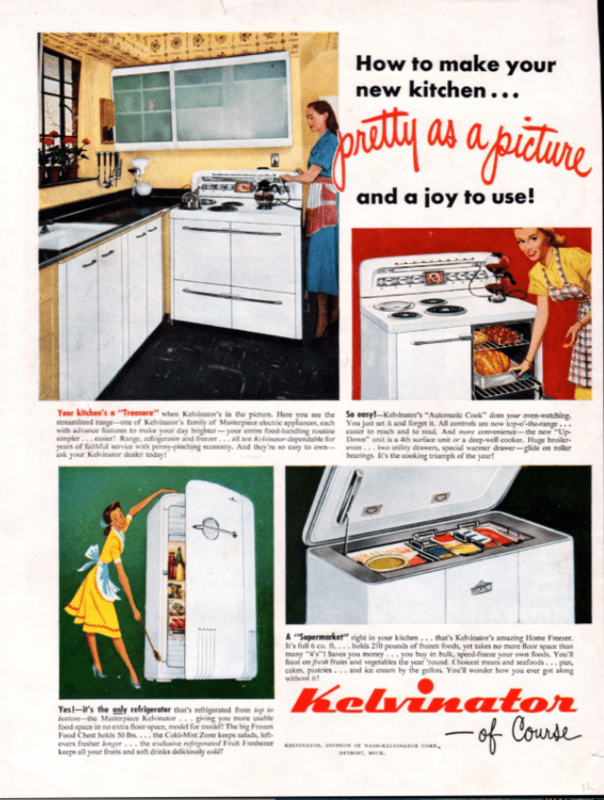 It seems strange, really, when the Kelvinator is ultimately about the food. Why do the colors look so vibrant on everything else, and so peculiar on the food?